Erin Teschuk first started running cross-country in elementary school as training for soccer – and because she got to miss class for meets and practices. In grade nine, when Erin realized her favourite part of soccer practice was running laps, she joined the Winnipeg Optimist Athletic Club, and from there her track career took off. After high school, Erin moved to North Dakota to attend North Dakota State University. She is currently pursuing a bachelor’s degree in psychology, and continues to excel in track, this year becoming a seven-time All American, and representing Canada at the 2016 World Indoor Championships. 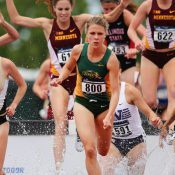 While Erin’s favourite event is the 3000-metre steeplechase, she is also known to be a dominant mile runner, most recently competing in the Wanamaker Mile race at the world-famous Millrose games. Her most memorable moment in sport was her first time competing on the international stage: at the Bird’s Nest Olympic Stadium at the 2015 World Championships. Born and raised in the province, Erin says she loves many things about her home. Erin’s coach at NDU has helped her to make clear goals. “Putting your all into something you care about is always going to be worth it, regardless of the final outcome,” Erin said. She hopes to train and compete in a way that she can look back on her time in the sport and know that she got the best out of herself. 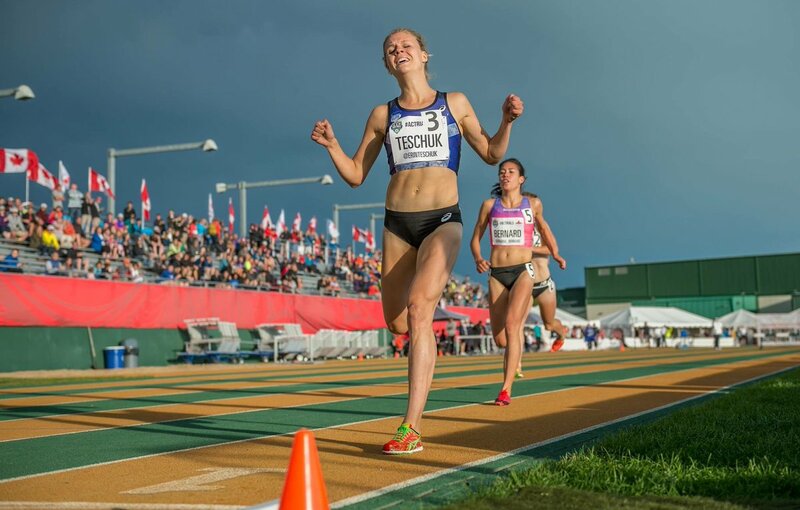 Erin became Canada’s back-to-back steeplechase National Champion at the 2016 Athletics Canada selection trials, and made her Olympic debut in Rio in August. Erin and her teammates Geneviève Lalonde and Maria Bernard became the first Canadian women to ever compete in the Olympic steeplechase event. Erin’s heat time of 9:53.70 was nearly 14 seconds slower than her personal best, putting her 16th in her heat, not fast enough for her to move on to the final. 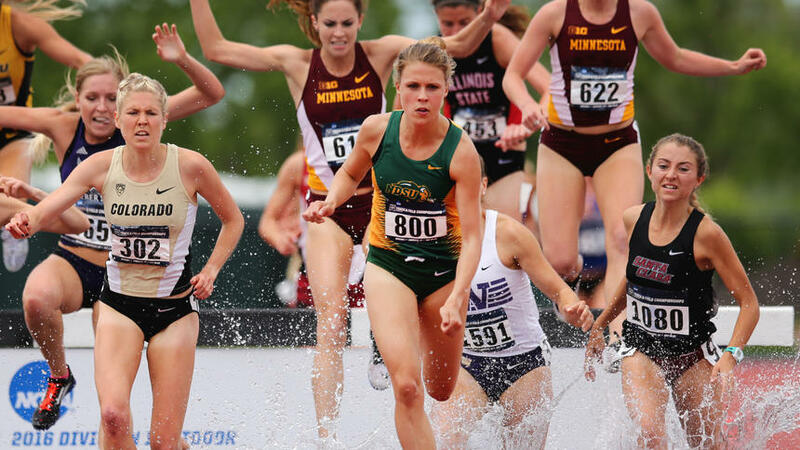 Her Olympic debut came just three years after taking up the event of steeplechase, meaning her 46th place finish didn’t dampen her spirits whatsoever. Result: Erin finished 46th overall with a time of 9:53.70. 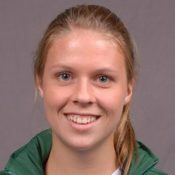 NDSU (July 19) North Dakota State’s Erin Teschuk will represent Canada in the 3,000m steeplechase at the Olympics in Rio de Janeiro, Brazil, in August. Relive her remarkable career as it was chronicled on Twitter over the years. WINNIPEG FREE PRESS (July 11) Athletics Canada has confirmed three Manitobans are expected to be a part of the Canadian track and field contingent headed to the 2016 Olympic Games in Brazil next month. 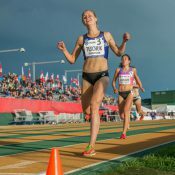 ATHLETICS CANADA (July 9) With five women holding the Olympic standard, the women’s steeplechase final was a dramatic way to end day two. WINNIPEG FREE PRESS (July 8) Teschuk, from Winnipeg, won a thrilling steeplechase race in which six women went in with the Olympic standard. 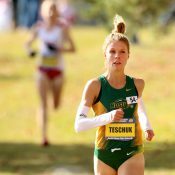 WDAY (July 8) Erin Teschuk ran in the 3,000 meter steeplechase on Friday as the Winnipeg native and former Bison tried to clinch her spot on team Canada for the Olympic games in Rio.